A Chinese LM-3C rocket carrying a Beidou navigation satellite lifts off from Xichang Satellite Launch Center on November 1, 2010. China launched its sixth Beidounavigation satellite Sunday,reaching another step in a program to provide precise positioningservicesacross the Asia-Pacific region by 2012. The three-stagerocket, standing 180 feet tall at liftoff, placed the Beidoupayload oncourse toward geosynchronous orbit, according to the Chinese government. According to tracking data, thespacecraft is in apreliminary orbit stretching from a low point of 115 miles to a highpoint ofabout 22,260 miles. Its inclination angle is 20.5 degrees. The Beidou, or Compass, satellitewill fire its own engineto reach a circular orbit 22,300 miles above the equator. It is thesixthsatellite launched in the first phase of the system'soperationalfleet. The craft launched Sunday is thefourth platform designedfor geosynchronous orbit over the equator. One satellite is in amedium-altitude orbit more than 13,000 miles high, and anotherspacecraft wasinjected in an inclined orbit to cover Earth's polar regions. Four Beidousatellites have been sent into space so far this year. 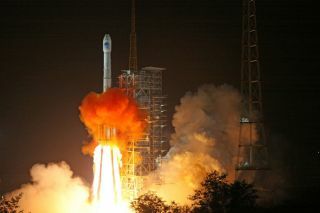 China plans one more Beidou launch inDecember, when anothersatellite will be sent to cover high latitude and polar users. The Beidounetwork will provide Chinese military and citizens anindigenous source ofprecise navigation information. The country currently relies on theU.S. AirForce's Global Positioning System. Experimental Beidou satellites beganlaunching in 2000, andChinese officials hope the system can provide full navigation andtimingcoverage of China and neighboring countries by 2012. China will eventually launch 35satellites to expand thesystem to global coverage by 2020. Most of the operational Beidousatelliteswill circle 13,000 miles above Earth. Five spacecraft will eventuallysupportthe system from geosynchronous orbit. The constellation is China'scounterpart to the U.S. GPSsystem, Russia's Glonass navigation satellites and the Galileo networkbeingdeveloped by Europe. China says Beidou services will beavailable at no charge tocivilians with positioning accuracy of about 10 meters, or 33 feet.Moreprecise navigation data will be given to Chinese government andmilitary users.